If I think about metallic, I think about gold, silver, steel… jewellery! Today I choose Pomellato e-store: http://store.pomellato.com/gb . Pomellato jewels are characterized by contemporary Italian design, strength of the goldsmith tradition and uniqueness of the brand. I’d like to buy something, but for now I can only dream … I choose the type of material, white gold. Then I choose the stone, black. 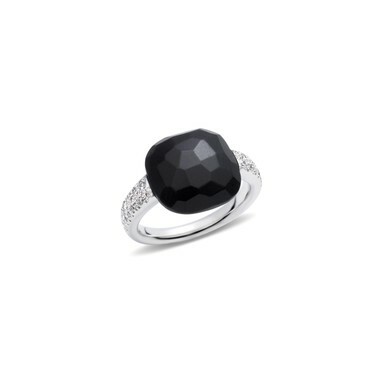 I roll my eyes, my metallic ring is there in front of me and I imagine it on my finger… it’s perfect! From home I can access to e-store Pomellato67, which is one of the Pomellato’s sub-brands. Here there are jewelry design more young and aggressive, a bit cheaper and certainly very interesting. I’m dreaming… and I choose a ring here! I could proceed with the purchase: I register, I enter my address and my credit card data (Visa, MasterCard, American Express and JCB, Visa Electron). The products are sold directly from Yoox.com and secured by VeriSign secure server and ATWcertificate to ensure maximum protection. You can buy 7 jewels each time, shipping costs are about 15 Euros, the delivery takes about 3 days and you can return the goods back to the sender without additional costs. Come on … Do it, filled a shopping cart, dream… Good shopping to all!